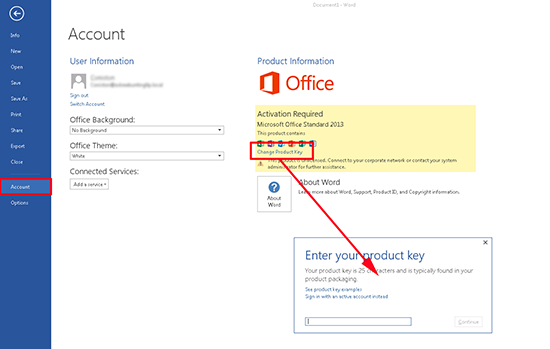 Both ‘box product’ or retail versions of Office require you to add the key and activate them at install time. But volume licensed or MAK versions do not. This makes it easy for you to forget. If you use KMS that’s not a problem, by default they will licence themselves from there. However if you need to put in a MAK key this has to be done manually or office will start complaining. 1. Launch an Office application, in this example I will use Word. 2. File > Account > change product key > Paste in your unlock code > Continue. 3. Close and re-open your Office application(s).